This Admissions Policy is one of the most important documents the school has produced. It is written for parents and students who wish to find out about the school and how to apply for admission to this school. This policy is rooted in the school’s fundamental aim of providing a comprehensive system of Post Primary Education open to all the children of the community. The policy sets out the procedures to be followed in the following circumstances. Students from outside of the school applying for a place in any other year group or programme. Students applying to transfer from another Second Level School. 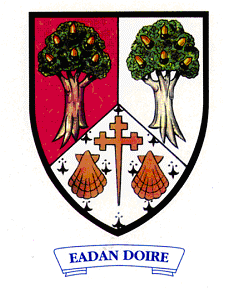 Oaklands Community College is a co-educational, multi-denominational, multicultural post primary school located in Edenderry, Co Offaly. The Oak trees above the incline reflect the Edenderry name – Eadan Doire – the Brow of the Oak. It also records the arms of O’Connor Fahy, the principal ruling family of Offaly in the Middle Ages. The cross recalls the Franciscan Monastery of Monasteroris. The two escallops are taken from the Arms of the Marquess of Downshire, who was largely responsible for the development of the town in the last century. The overall design reflects the topography, history and achievements of the area. Section 9 of the Education Act states that a recognised school shall provide education to students, which is appropriate to their abilities and needs and Section (9a) ensures that the educational needs of all students, including those with a disability or other special educational needs, are identified and provided for. States 19(1) that the Board of Management of a recognised school shall not refuse to admit a student in such school a child, in respect of whom an application to be to admitted be made, except where such refusal is in accordance with the policy of the recognized school concerned published under section 15(2)(d) of the Act of 1998. States in19(2) that The parent of a child who has made an application referred to in subsection (1) shall provide the recognised school concerned with such information as may be prescribed by the Minister. States that in 19(3) that as soon as practicable, but not later than 21 days, after a parent has provided, in accordance with subsection (2), such information as may be subscribed by the Minister there under, the Board of Management of the school concerned shall make a decision in respect of the application concerned and informed the parent in writing thereof. prohibits discrimination on the grounds of “gender, marital status, sexual orientation, religion, age, disability, race or membership of the Travelling Community” regarding admission, access to programmes, participation in the School or regarding expulsion or any other sanction. This Act outlines in Section 3 the Preparation of an education plan by School (including steps preliminary to such preparation), Sections 4 & 5 referring to the Assessment of the child and modes of assessment. Section 7 outlines the resources available to the School including physical classroom accommodation, class size, teaching and financial resources and is also subject to the capacity of the School to provide for the educational needs of those who apply for admission. We are committed to providing a holistic education with the aim of developing the academic, cultural, sporting, moral and spiritual needs of our students. The aim of Oaklands Community College is to provide an enriching environment for the academic, moral, spiritual and social education of its pupils, and to nurture the growth and development of all. The school ethos is Christian and each individual is respected regardless of religious persuasion and is guaranteed access to the educational facilities at the school. The Curriculum is designed with the modern world in mind and students are equipped with the skills and qualifications necessary to confront any problems they may encounter in life. The school is managed by a Board of Management and offers a Christian environment, fostering the emotional, moral and social development of students. Under the Education Act 1998, the Board of Management is a legal entity with legal responsibilities and obligations. The Board of Management consists of Parents’ Representatives, Teacher Representatives and Laois/ Offaly ETB Representatives. The teaching staff at Oaklands Community College are employed by Laois/ Offaly ETB and are paid by the Department of Education and Science. – To adopt a programme of activities, which will promote the involvement of parents in the operation of the school, in consultation with the Principal. Oaklands Community College has a very active and enthusiastic Student Council. A new Student Council was elected this September. It is made up of elected representatives from each of the class groups who do their best to give their fellow students a voice in school matters. They are also actively involved in school policies and make a very important contribution to the school community. The school is open from 8.30 am to 4.30 pm. Opening hours may be extended to facilitate extra curricular activities. A comprehensive school calendar detailing school holidays, parent teacher meetings, examination dates and other important events is posted to parents annually. To be eligible for admission to this school a student must have reached 12 years of age on the 1st of January in the calendar year following the student’s entry into the school. In order for all applications/transfers etc. to be considered, a completed Oaklands Community College Application Form must be submitted. The number of students that the school will enrol into first year will be decided by the Board Of Management of Oaklands Community College in conjunction with The Chief Executive of Laois/ Offaly Education and Training Board. The school will have an Open Night in October/ November. This will be published by contacting all Primary Schools in the catchment area and supplying information in relation to all relevant dates and timelines etc. Parents will have to submit the school enrolment form by a specified date, to complete a form of acceptance on offer of a place and pay an administrative charge. All students will be required to sit an assessment test. This is for assessment purposes only and will have no impact on whether the child will get a place in this school. Applicants will be informed within 21 days of the closing date of applicants of the decision of the Board of Management on their application. Relations (this applies to sons, daughters, brothers or sisters of past-pupils only or members of the current staff of the College – provided the student is living in the catchment area. students both living in the catchment area, and attending National Schools in the catchment area . A waiting list will be generated on a first come first serve basis for all students over and above the proposed enrolment number for the year. Students will be offered any places that become available. The school authorities being satisfied regarding the reasons for application. While it is appreciated that in certain exceptional circumstances transfers are unavoidable (e.g. a change of residence or a family moving in into the area) as a matter of general policy transfers into the school are discouraged in the overall interests of the continuity of the student’s education. The behaviour record of the student in his/her previous school(s) shall be considered before he/she is admitted as a student of this school. However the school must be satisfied with the reasons for the transfer and to this end information may be requested from the student’s former school(s) concerning attendance, educational progress and other physical or educational requirements. With the best interest of the student and with the interests of other students in the school in mind and considering the issues relating to mid year transfer which may include subject choices, class sizes and available resources, the School Board may decide to refuse admission at that time and advise his parents/guardians to reapply if they so wish before the start of the following academic year. 1. Reasons for transfer should be clearly stated. (ii) The two most recent reports from the pupil’s previous school. A written reference report from the previous school together with two additional references, dated within one month of the date of application, from a local Youth Club/Sports Club or similar organisation and/or a member of the Garda Siochana or a person of standing in the community. A statement on special needs, if relevant. 3. This college also reserves the right to request a confidential reference from the authorities in previous school(s). An established prior record of poor behaviour. Lack of adequate resources to cater for particular needs. Applications to transfer into the school will be considered having regard to the overall wellbeing of existing pupils and the availability of physical space and resources. Following consideration by the Board of Management of individual applications to transfer into the school, where the Board has good grounds for forming the fair and reasonable opinion that it would not be in the best interests of the existing students to accept such a transfer, it is the policy of the school to refuse to enrol such applicants. Note: Applications will not be accepted from students who are the subject of ongoing disciplinary proceedings in another school which includes any ongoing statutory appeals procedures in accordance with the Education Act 1998 or the Education for Persons with Special Needs Act 2004. 5. It is the policy of the Board of Management not to accept transfers during the school year. However, in the case of students whose family have moved into the catchment area, and who are not enrolled in another post primary school, applications will be considered. Ability to match subject choice. The Board of Management reserves the right to refuse an application for admission of a student from other second level schools. Mid-cycle transfers are discouraged in the interest of the student’s education. Applicants who completed their Leaving Certificate in the school will be interviewed by the Principal/Deputy Principal to assess their suitability for the course. Other applicants will be considered as transfer students. Admission to Specific Programmes or Subjects (or Subjects at a Specific Level) from Students within the School. In relation to the above courses, an application process will apply. The school will be the final arbiters of who enters any of the programmes listed above. • Oaklands Community College welcomes applications from students with special educational needs unless the nature and degree of those needs is such that to enrol the student concerned would be inconsistent with both the best interests of the student concerned and the effective provision of education for the other students with whom the student concerned is to be educated. Oaklands Community College has an Autistic Spectrum Disorder (ASD) Unit in the school. A separate admissions/ enrolment policy exists for this unit and is available from the school on request. • The Board of Management must be made aware of any special needs as early as possible, so that these needs can be assessed and addressed where possible. • Any details of special needs must be detailed on the Application Form and with any additional relevant documentation. • The Board of Management, having gathered all relevant information and professional documentation, assesses how the needs of these students can be met. • Contact will be made with the National Council for Special Educational Needs regarding special needs resources to which the student may be entitled. • The Principal may request a meeting with the parents of the student to discuss the application and the student’s needs. • The parents of the student may request a meeting with the Principal to discuss the student’s educational or other needs. • As soon as is practicable, but not later than 21 days, after a Parent/Guardian has provided all the relevant information, the Board of Management shall make a decision in respect of the application concerned and inform the parents/guardians in writing thereof. Education Welfare Act (Section 19 (3)). Applicants with special needs must meet the entry criteria set out for all students in this policy. The regular admissions procedures must also be adhered to. The existence of special needs requirements does not give any individual applicant any prioritised entry entitlement. The Board of Management reserves the right to refuse to enrol a student who has applied for admission to the College. In the event of refusal, the parent has a right to appeal under Section 29 of the Education Act (1998). Parents/Guardians or students 18 years of age or over whose application has not been accepted, are welcome to seek advice regarding alternative placement. The Board of Management reserves the right to refuse an application or admission in exceptional circumstances. Education Welfare Act 2000, Section 24 (5), Page 22 Education Act 1998, Section 29, Page 27, Circular Letter M48/01. An appeal may be made to the BOM, then Laois/ Offaly ETB and then the Secretary General of the Department of Education and Science. The Appeals Administration Unit, Department of Education and Science, Marlborough Street, Dublin 1. All other relevant information etc. The school must be informed in writing of the decision of the appeal. Having regard to the desirability of resolving grievances within the school where possible, the parties to an appeal under Section 29 i e. the appellant and the school’s Board of Management, will be asked to consider the matter in the first instance at local level to see if an accommodation can be reached. As a general rule, appeals will only be considered by an Appeals Committee under Section 29, where the parties are unable to resolve the issue at local level Circular M48/01). Co. Offaly and Laois E.T.B. is registered as a Data Controller under the Data Protection Acts 1988 and 2003. The personal data supplied on this application form is required for the purpose of student enrolment, registration, child welfare and to fulfil our other legal obligations. Contact details will be used to notify of school, E.T.B. events and activities. While the information will be treated as confidential to C.N.C and O. & L. E.T.B. from time to time it may become necessary for us to exchange personal data on a confidential basis with other bodies inc. the Dept. of Ed & Skills, the Dept. of Social and Family Services, An Garda Siochana, The H.S.E., the N.E.W.B. or with another school if the student is transferring. We rely on parents/guardians to provide us with accurate and complete information and to update us in relation to any change in the information provided. Should you wish to update or access your child’s personal data you should write to the school Principal. A copy of the full Data Protection Policy of Co. Offaly and Laois E.T.B. is available on request from head office. The school maintains a database of photographs of school events held over the years. It has become customary to take photos of students engaged in activities and events in the interest of creating a pictorial as well as historical record of life at this school. Photos may be published on our school website or in our brochures, newsletters, local and national newspapers and similar related productions. In the case of website photographs, student’s names will to be recorded with the picture. If you would prefer not to have your child’s photo included in such records please notify the Principal.